1964: construction of the first building of the branch complete. 1965: first work sector, first orders for the independent development of the "Alleya-B", "Alleya-A" systems. 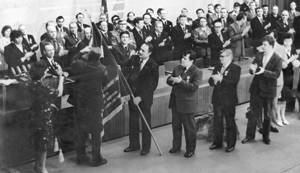 1967: second work sector, first orders for the development of the "Tsentr", "Vulkan" systems. 1970: re-organization of the branch of the Central Naval Research Institute into a self-sufficient research institute "Mars". 1972: creation of the first CMSs "Alleya-B" and "Alleya-A". 1975: State Prize of the USSR to the developers of the "Alleya-B" CMS. 1975: Prize of the Council of Ministers of the USSR for creation of complex benches. 1977: Lenin Prize to the designers of the Project-1143 aircraft-carrier, including the Chief Designer of the "Alleya-2" CMS Valentin Kidalov. 1979: creation of a command subsystem for the Navy and computer-aided packages for authorities of the Ministry of Defence. 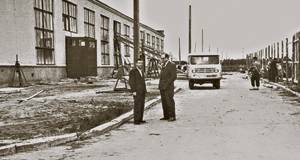 1981: Order "Trudovoe Krasnoe Znamya" to our Company for the creation of the command subsystem for the Navy and computer-aided packages for authorities of the Ministry of Defence. State Prize of the USSR in the field of science and engineering to the developers. Lenin Prize to the Chief Designer of the Navy Command Subsystem Vyacheslav Alekseychik. 1982: government awards for the installation and mounting of the "Alleya-2K" CMS on the aircraft-carrier cruiser "Novorossiyisk". 1984: Order "Druzhba Narodov" to the Chief Designer of the "Alleya-2K" CMS Valery Badaev. 1985: State Prize to the Chief Designer of the "Alleya-2M" CMS Ivan Solonovich. 1985: State Prize of the USSR to the Chief Designer of the "Lesorub-1164" CMS Alexander Senchuk. State awards to a group of specialists for the equipping of the Project-1164 ship with the "Lesorub-1164" CMS. 1991: call-off contract with "Nixdorf" (Germany), beginning of our production re-equipment. 2004: International Prize "Quality Standard" (from IEI). 2004: title "Business Leader in Povolzhye" in the nomination "Instrument-making, Electronics and Electrical Industry". 2004: Prize "Russian National Olympus" in the nomination "Industry" (Charitable Organization for Social Development "Third Millennium"). 2005: Medal of the Winner of the 4th All-Russian Contest "1,000 best Russian Companies in 2005". 2005: Prize of the Government of the Russian Federation in the field of science and engineering for the creation of the Navy C2 System. 2008: Diploma of the Chief of the Navy Staff "For the achieved success …". 2008: 1st Prize in the nomination "The Best Company Subcontractor" (decision of the organizational committee of the national prize "Gold Idea") for the creation of the "Sigma-E" system. 2009: 1st Prize in the nomination "The Best Organization" in Ulyanovsk contest "The Best Economist in 2009". 2010: finalization of the design and development work of the Integrated C2 System for the Navy. 2011: Diploma of the Government of the Russian Federation to our Company "For a great contribution to the development of the shipbuilding industry and creation of special-purpose equipment". 2011: Order "Druzhby" to the milling-machine operator Igor Romashin. 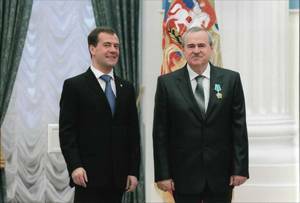 2011: Medal of the 2nd-degree Order "For Fatherland Deserts" to the First Deputy Head of a Complex Research Department & Chief Designer Sergey Krasovsky, chief specialist Klavdia Nikolaeva, leading programmer Olga Tonkikh. 2014: Vladimir A. Maklaev, the Director General of the FRPC OJSC ‘RPA ‘Mars’ has been awarded the State Prize of the Russian Federation n.a. Marshal of the Soviet Union G.K. Zhukov. 2014: An Integrated Computer-Aided C2 System of in-house design was accepted for munition of the Armed Forces of the Russian Federation. 2017: Dmitrii Mikhailovich Iastrebov, the Chief Designer and Deputy Head of Complex Research Department, Vsevolod Stanislavovich Filin, the Chief Designer and Deputy Head of Research Department, and Nadezhda Mikhailovna Kniazkina, the Laboratory Assistant in Chemical Analysis of the 5th category have been awarded the Medal of the Order for Merit to the Fatherland in the 2nd degree.